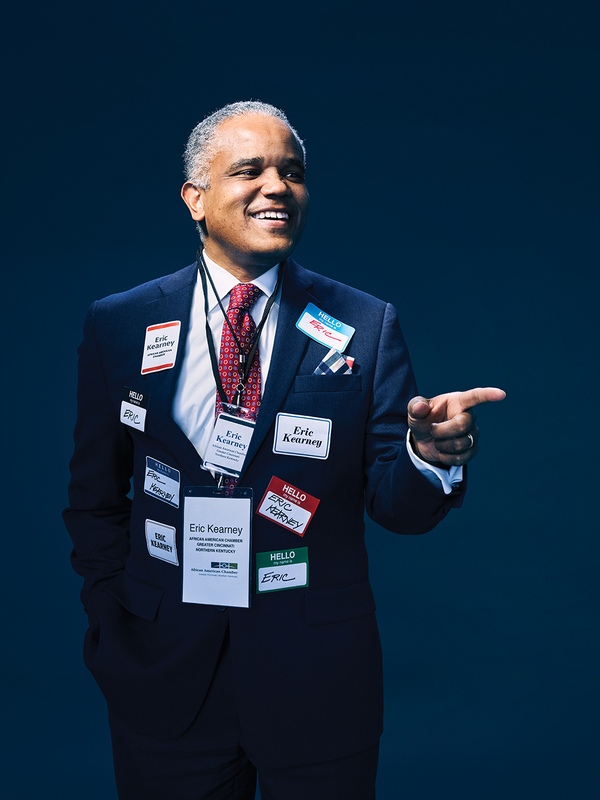 When one door closes in business, politics, or life, Eric Kearney opens another. And holds it open for everyone else. Eric Kearney isn’t shy. In a well-tailored suit offset with a snazzy pocket square, he is alight in a room full of people, introducing each to someone else, making connections like a magnet charged with positive energy. He spins from one conversation to the next, prompting strangers to get acquainted. Kearney, 55, is known for uniting and connecting. 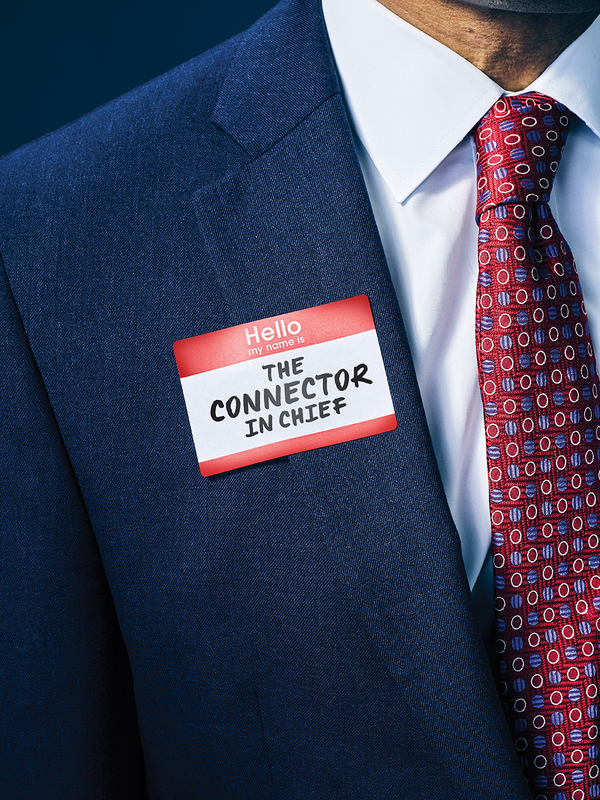 It’s his basic job description as president and CEO of the Greater Cincinnati and Northern Kentucky African-American Chamber of Commerce, and a role he’s been comfortable playing as a former State Senator, an attorney, and a small business owner. He’s surprisingly mischievous one minute, completely serious the next. He walks from Cleveland to Cincinnati to promote a worthy cause, and gets rid of his car to rely on public transportation day to day. His office soundtrack is opera, but he plays the Isley Brothers R&B classic “Work to Do” on his weekly chamber-sponsored talk show on WDBZ-FM. His wife wants him to run for office again, but he doesn’t think he will. “There are so many things to do here,” he says with the Zen-like calm of a man who has it all under control. The African-American Chamber of Commerce is one of many such organizations in the area, most of which serve a geographic purpose—from the umbrella Cincinnati USA and Northern Kentucky chambers to more targeted ones like the Over-the-Rhine Chamber, the Anderson Area Chamber, and the Clermont Chamber. The African-American Chamber focuses on business development within a racial or ethnic affinity group, as do the local Hispanic, Chinese, and Indian-American chambers. As a result, less wealth has been created in the black community over the years, meaning friends and family are less able to provide capital to help start a business. Forbes writer Brian Thompson has called the racial wealth gap “America’s most pressing epidemic.” According to 2016 Federal Reserve data, median wealth for white families in the U.S. is $171,000, while black families have a median wealth of $17,600. Eric is smart off the charts, kind, and humble. When he calls, companies listen. That’s one less hurdle for us to get over. As a tactic to meet that objective, the chamber launched a real estate investment fund in April 2018 to help small investors pool funds to invest in real estate in order to maximize returns over a seven-year period. It’s the type of deal that middle-class investors usually aren’t invited to participate in. Any gains distributed to the fund can be re-invested in the local African-American community. In a city whose population is 45 percent black, I ask Kearney, why aren’t 45 percent of local businesses black-owned? In an emerging neighborhood like Over-the-Rhine, why don’t the business owners reflect the residential demographics? The chamber is tackling those questions by partnering with the MORTAR entrepreneurial lab, Findlay Market, and developers 3CDC, Model Group, and Urban Sites on a new initiative called Represent, with the goal of increasing the number of minority-owned businesses in Over-the-Rhine specifically. The neighborhood, whose population is more than 60 percent black, has less than 6 percent black-owned businesses and no roadmap for closing that gap. William Thomas, cofounder of MORTAR, says the coalition has been doing research, hosting focus groups, and digging into data to explore options since Represent’s launch in October. 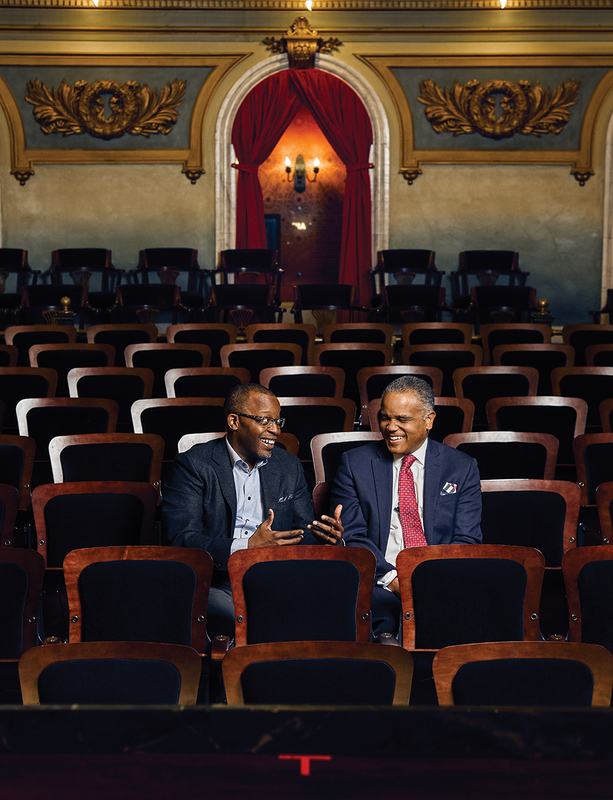 Mel Gravely (left) and Eric Kearney (right) at Memorial Hall, which Gravely’s company renovated. That makes Smith’s company exceptional. Of 2.6 million black-owned businesses in the U.S. in 2012, fewer than 110,000 had more than one employee. Single-person businesses are inherently harder to sustain. You get the flu, and your entire company is closed; but if you have employees, you can realistically consider long-term goals. Of the black-owned businesses with paid employees, nationally, most are clustered in the areas of health care and social assistance. In Cincinnati, Kearney says, most successful minority businesses with multiple employees are construction-related and consulting firms. The chamber’s Sudduth Society, an entrepreneurship incubator, focuses on helping smaller member companies grow from $250,000 in annual revenue to $500,000. The difference between those numbers, Kearney says, is the difference between merely surviving and thriving. He points to Sudduth participant MDI, a Springdale-based direct marketing company that more than doubled its revenue through the program’s networking and knowledge-sharing opportunities. He has a gentle firmness with the way he pursues goals. When you see him out, he talks like a regular dude, but he talks about business. He listens. And he hears. When Kearney was in the Ohio Senate, he sponsored legislation to start Minority Business Assistance Centers across the state to help business owners navigate the MBE certification process. The services these centers provide, at no cost, help businesses get through the procurement process to attain state government contracts. Creekwood worked with the chamber to get MBE certification at the state and city levels, and DeLyons says as a result he’s consulting in both Columbus and Cincinnati to develop infrastructure and sources for renewable energy. Before Kearney became a chamber executive, he and his wife, Jan-Michele Lemon Kearney, were charter members from its founding in 1996. The couple started Sesh Communications, which produces The Cincinnati Herald and other publications. Eric is no longer involved with Sesh but remains a partner with Jan-Michele in their law firm, Kearney and Kearney. He knows personally how chamber membership benefited his own businesses over time, especially The Herald, whose stories, subscriptions, and advertisers are connected throughout Cincinnati’s African-American community. He represented Ohio’s Ninth Senate District from 2005 to 2014, appointed to the seat when Mark Mallory resigned to run for mayor of Cincinnati, and elected twice on his own. While in office, Kearney wasn’t afraid to reach across the aisle, leading a bipartisan effort with Republican Senate President Tom Niehaus to reform and bolster employee pensions. He established the Saturday before Thanksgiving as Adoption Day across the state and set up funding to make adoptions more financially accessible. He led the effort to make February Black History Month in Ohio. And then the English major—he holds a B.A. from Dartmouth College—established Ohio’s first Poet Laureate position. When the Kearneys purchased the newspaper, its taxes were in arrears. During the sale, a payment plan was established for Sesh Communications to catch up on the back payments. When Kearney’s candidacy was announced, though, news stories implied that he personally owed back taxes. The FitzGerald candidacy didn’t seem like much of a threat to Gov. John Kasich’s reelection bid, but Kearney says his connections to President Obama had the potential to bring the Democratic National Committee’s weight and deep pockets into the race. That kind of threat scared the GOP, says Kearney, and suddenly negative campaign ads tied The Herald’s business finances to his own. He chose to withdraw, and the Democratic ticket went on to a crushing defeat. Jan-Michele says her husband was bowed by the experience but has persevered because he knows what it takes to be successful and to make a positive difference. Kearney’s father, Jasper, worked as a chemist at the EPA during the day and as a waiter at Camargo Country Club in the evenings, while his mother, Rose, taught school. Their goal was to make sure that Eric, their only child, got the best education. Their daughter, Celeste, is a student at Dartmouth, her father’s alma mater. Son Asher is 14 but, Kearney jokes, “going on 21.” When the kids were younger, he commuted from Cincinnati during his years in the State Senate rather than keeping an apartment in Columbus. Once a year, Kearney and a few brave staff members and friends walked up Montgomery Road, State Route 22, from Cincinnati to Columbus. In his final year in office, he walked from Lake Erie through Columbus and all the way to the Ohio River. He loved it. If so, Kearney knows how to find the door.